Typical Singaporean condiments that go with congee for breakfast, evening or late supper – Salted eggs (Telur Masin). Salted eggs are also in abundance during the Mooncake festival locally. The eggs are used as a filling for mooncakes. Each mooncake costs more with more egg yolks. Boil water with salt. Cool. Wash eggs and put in a container (preferably earthen). Pour enough water to cover the eggs. Cover container. Leave eggs in salt water for two weeks before serving. Note: After 2 weeks, take one egg out and boil for 10-15 mins to test if its taste is salty enough. If not ready, let the rest in the container for a few days more. When it’s ready, drain the eggs and wipe dry. Keep them in an egg carton and place in fridge. The salted eggs can be kept for a few weeks in fridge. Recipe submitted by Agnes Wong. hehe..recipe telur masin pun ada? ini makan dengan bubur sedap nie pagi pagi. teringat time sahur ramadan. hey i’m going to try this out! never thought of making my own salted eggs. i really love eating them with porridge. thank you for the recipe. This looks gorgeous. 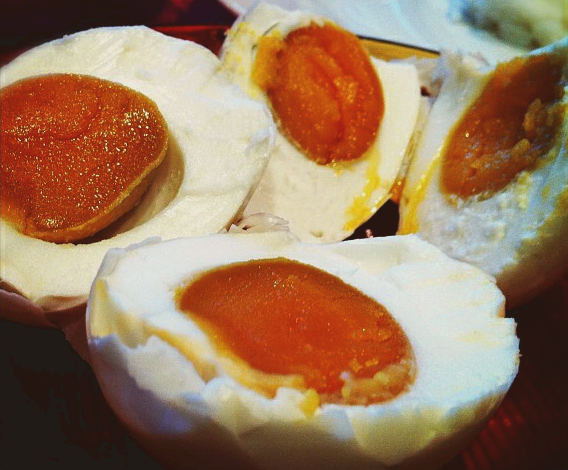 These salted eggs are a sure way to boost your appetite hehe … they are my fave!